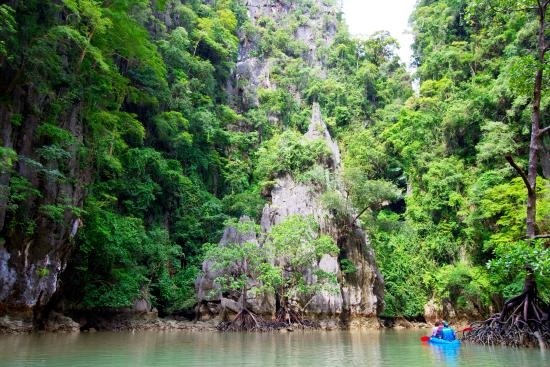 A distinctive feature of Phang Nga Bay is the sheer limestone cliffs that jut vertically out of the emerald green water. 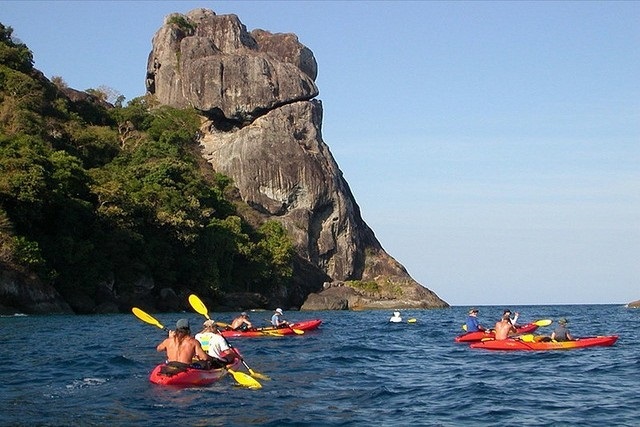 James Bond Island and Koh Pannyi are just two of the more famous spots in this bay. 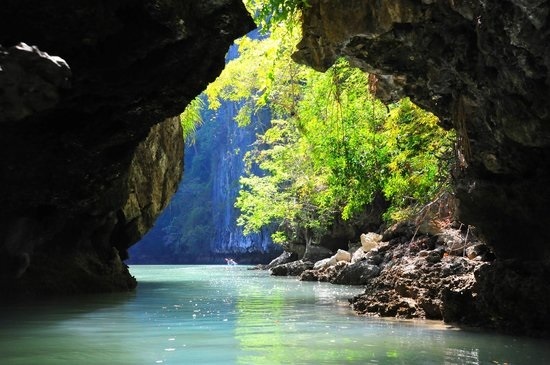 By far the best means of enjoying the spectacular scenery, with only brief encounters with the tourist crowds as James Bond and Koh Pannyi, is to take one of the boat trips from the northern end of Phuket. A leisurely day trip cruising through the dramatic limestone islands, occasionally stopping to enjoy quiet beaches, is far more rewarding than the standard bus-boat tour. - Arrive at Ao por pier, north east of Phuket, Once on the boat, please don’t argue about putting on the life preservers; it’s apparently required by law and the crew will be monitored by officials while at or near the pier. Depart for The National Park Phang Nga Bay,,fun , safety presentation. Inflatable canoes designed for 3 people: the guide, who does all the paddling, sits in the back, with 2 guests in front.. 3G/4G coverage in most of the bay. - Cruise to the beach, There will be plenty of drinking water and snacks. This is also a good time to apply that sunscreen. Also a good time to get your “sea legs”, practice walking on the boat This was an opportunity to take out the canoes and paddle for ourselves, or simply to swim on the beach for a bit. 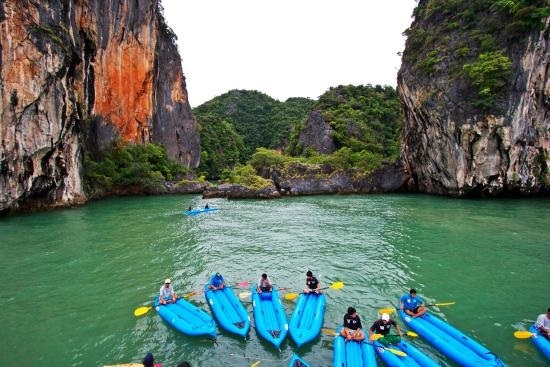 - Arrive Phang-Nga Bay, Paddle and explore the 2 most famous Islands (Panak Island), enter caves 20-150 m. (dark, long) navigate you through the caves and to the lagoons, show you the monkeys, bats, walking fish, and notable rock formations. - Buffet Lunch served on board included a variety of Thai options and fresh fruit but nothing too spicy, our trip included a drive-by of the iconic James Bond Island, stopping several minutes for a photo opportunity (No visiting due to it ‘s always very crowded) Our buffet menu are : - Chicken soup Thai style -whole fried fish with medium spicy sauce -Phuket noodle -Chicken fried with cashews nut -Tempura shrimp -Deep fried chicken drums -Mix vegetable -Fried rice with eggs. -We cater for vegetarians and none fish eater too. Note**** Please let us know the day before the trip. 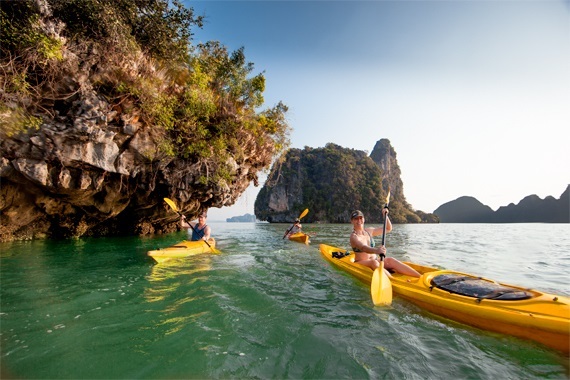 - Arrive to Hong Island , the most popular island is a circle of rocks in to the sea surrounding the lagoon. There are also snacks and sandwiches served on the final trip back to the pier. - Arrival Ao por pier and transfer to hotel. **Note each day changes slightly due the sea tides. 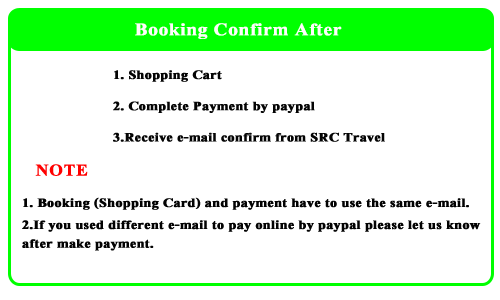 1 May-31 October: Khaolak area 2500 baht/Car/Private round trip transfer free transfer on Monday, Tuesday , Thursday and Saturday .